The 5.56×45mm NATO (official NATO nomenclature 5.56 NATO) is a rimless bottlenecked intermediate cartridge family developed in the late 1970s in Belgium by FN Herstal. It consists of the SS109, SS110, and SS111 cartridges. On 28 October 1980 under STANAG 4172 it was standardized as the second standard service rifle cartridge for NATO forces as well as many non-NATO countries. The 5.56×45mm NATO cartridge family was derived from, but is not identical to, the .223 Remington cartridge designed by Remington Arms in the early 1960s. Source(s): NATO EPVAT testing, QuickLOAD, SAAMI, C.I.P. The 7.62×51mm NATO and 5.56×45mm NATO cartridges compared to a AA battery. In 1954, the 7.62×51mm NATO rifle cartridge was selected as the first standard NATO rifle cartridge. At the time of selection there had been criticism that the recoil power of the 7.62×51mm NATO, when fired from a hand-held lightweight modern service rifle, did not allow a sufficient automatic rate of fire for modern combat. The British had extensive evidence with their own experimentation with intermediate cartridges since 1945 and were on the point of adopting a .280 inch (7 mm) cartridge when the selection of the 7.62×51mm NATO was made. The FN company had also been involved in the development of the .280 round, including developing a version of the FN FAL in .280. The concerns about recoil and effectiveness were effectively overruled by the US within NATO, and the other NATO nations accepted that standardization was more important at the time than selection of the ideal cartridge. Service rifle cartridge cases: (Left to right) 7.62×54mmR, 7.62×51mm NATO, 7.62×39mm, 5.56×45mm NATO, 5.45×39mm. Springfield Armory's Earle Harvey lengthened the .222 Remington cartridge case to meet the requirements. It was then known as the .224 Springfield. Concurrently with the SCHV project, Springfield Armory was developing a 7.62mm rifle. Harvey was ordered to cease all work on the SCHV to avoid any competition of resources. Eugene Stoner of Armalite (a division of Fairchild Industries) had been advised to produce a scaled-down version of the 7.62mm AR-10 design. In May 1957 Stoner gave a live-fire demonstration of the prototype of the AR-15 for General Willard Wyman, Commander-in-Chief of CONARC. As a result, CONARC ordered rifles to test. Stoner and Sierra Bullet's Frank Snow began work on the .222 Remington cartridge. Using a ballistic calculator, they determined that a 55-grain bullet would have to be fired at 3,300 ft/s (1,006 m/s) to achieve the 500-yard performance necessary. Robert Hutton (technical editor of Guns & Ammo magazine) started development of a powder load to reach the 3,300 ft/s (1,006 m/s) goal. He used DuPont IMR4198, IMR3031, and an Olin Powder to work up loads. Testing was done with a Remington 722 rifle with a 22-inch Apex barrel. During a public demonstration the round successfully penetrated the U.S. steel helmet as required. But testing showed chamber pressures to be excessively high. Stoner contacted both Winchester and Remington about increasing the case capacity. Remington created a larger cartridge called the .222 Special, which was loaded with DuPont IMR4475 powder. During parallel testing of the T44E4 (future M14) and the AR-15 in 1958, the T44E4 experienced 16 failures per 1,000 rounds fired compared to 6.1 for the AR-15. Due to several different .222 caliber cartridges being developed for the SCHV project, the 222 Special was renamed .223 Remington in 1959. In May of that year, a report was produced stating that 5 to 7-man squads armed with AR-15 rifles had a higher hit probability than 11-man squads armed with M-14 rifles. At a 4th of July picnic, Air Force General Curtis LeMay fired the AR-15 and was very impressed with it. He ordered a number of them to replace M2 carbines that were in use by the Air Force. By November, testing at Aberdeen Proving Ground showed that the AR-15 failure rate had declined to 2.5 failures per 1,000 rounds, resulting in the M-16 being approved for Air Force Trials. 1961 witnessed marksmanship testing comparing the M-16 to the M-14. 43% of AR-15 shooters achieved Expert while only 22% of M-14 shooters did. General LeMay subsequently ordered 80,000 rifles. In the spring of 1962, Remington submitted the specifications of the .223 Remington to the Sporting Arms and Ammunition Manufacturers' Institute (SAAMI). In July 1962, operational testing ended with a recommendation for adoption of the M-16 rifle chambered in 5.56 x 45mm. In September 1963, the .223 Remington cartridge is officially accepted and named "Cartridge, 5.56mm Ball, M193." The specification includes a Remington-designed bullet and the use of IMR4475 Powder which resulted in a muzzle velocity of 3,250 ft/s (991 m/s) and a chamber pressure of 52,000 psi. In 1970, NATO members signed an agreement to select a second, smaller caliber cartridge to replace the 7.62×51mm NATO cartridge. Of the cartridges tendered, the .223 Remington (M193) was the basis for a new design created by FN Herstal. The FN-created cartridge was named 5.56×45mm NATO with a military designation of SS109 in NATO and M855 in the U.S. These new SS109 ball cartridges required a 228 mm (1-in-9") twist rate while adequately stabilizing the longer L110 tracer projectile required an even faster 178 mm (1-in-7") twist rate. The Belgian 62 gr SS109 round was chosen for standardization as the second NATO standard rifle cartridge which led to the October 1980 STANAG 4172. The SS109 used a 62 gr full metal jacket bullet with a seven grain steel core for better penetration against lightly armored targets, specifically to meet a requirement that the bullet be able to penetrate through one side of a WWII U.S. M1 helmet at 800 meters (which was also the requirement for the 7.62mm). It had a slightly lower muzzle velocity but better long-range performance due to higher sectional density and a superior drag coefficient. This requirement made the SS109 (M855) round less capable of fragmentation than the M193 and was considered more humane. The .223 Remington cartridge inspired an international tendency toward relatively small-sized, lightweight, high-velocity military service cartridges that allow a soldier to carry more ammunition for the same weight compared to their larger and heavier predecessor cartridges, have favourable maximum point-blank range or "battle zero" characteristics, and produce relatively low bolt thrust and free recoil impulse, favouring lightweight arms design and automatic fire accuracy. Similar intermediate cartridges were developed and adopted by the Soviet Union in 1974 (5.45×39mm) and by the People's Republic of China in 1987 (5.8×42mm). The 5.56×45mm NATO has 1.85 ml (28.5 grains H2O) cartridge case capacity. 5.56×45mm NATO maximum NATO cartridge dimensions. 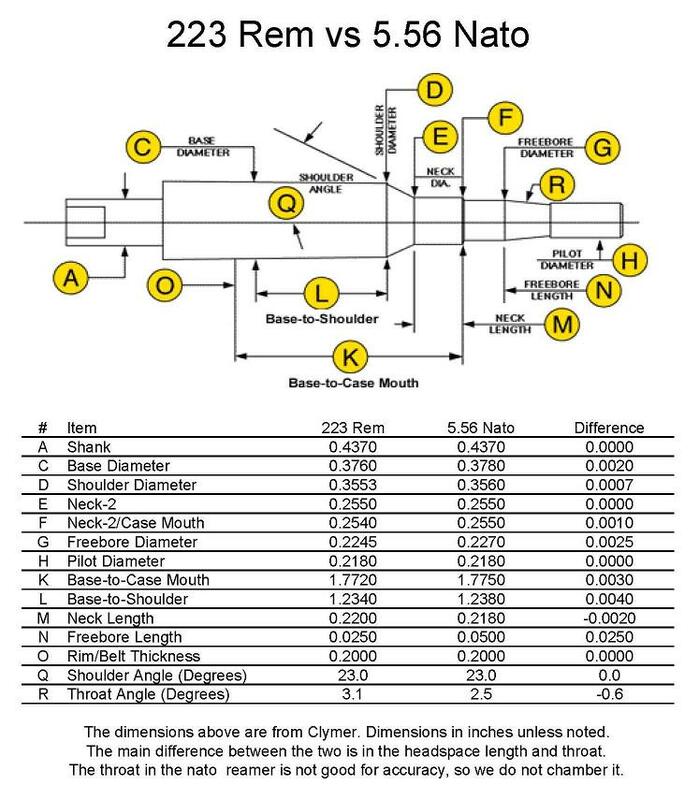 All sizes in millimeters (mm). According to the official NATO proofing guidelines the 5.56×45mm NATO case can handle up to 430.0 MPa (62,366 psi) piezo service pressure. In NATO regulated organizations every rifle cartridge combo has to be proofed at 125% of this maximum pressure 537.5 MPa (77,958 psi) to certify for service issue. The US SAAMI lists Maximum Average Pressure (MAP) for the .223 Remington cartridge as 55,000 psi (379.2 MPa) piezo pressure with deviation of up to 58,000 psi (399.9 MPa). The chamber for military 5.56×45mm NATO has a longer throat prior to the bullet contacting the rifling which results in lower pressures when firing 5.56×45mm NATO ammunition. If 5.56×45mm NATO is used in rifles chambered for .223 Remington the bullet will be engraving the rifling when chambered which can dramatically increase pressure past the proof test level. The C.I.P. rulings for the C.I.P. civilian .223 Remington chamber are much closer to the military 5.56×45mm NATO chamber. When 5.56×45mm NATO was adopted as standard in 1980, NATO chose a 178 mm (1-in-7") rifling twist rate for the 5.56×45mm NATO chambering to adequately stabilize the relatively long NATO L110/M856 5.56×45mm NATO tracer projectile. The US at that time converted all rifles in inventory by replacing the barrels and all new US military rifles since have been manufactured with this ratio. In the US builders of AR type rifles can specify barrels with either .223 Remington, .223 Wylde, 223 Noveske, or 5.56×45mm NATO chambers in lengths from pistol (7.5") to long rifle (24"). These barrels are also available with rifling ranging from 356 mm (1-in-14") to 178 mm (1-in-7"). US makers are moving toward 5.56×45mm NATO and 178 mm (1-in-7"), which will ensure the least liability. Bolt action rifles have few options in this regard. Those chambered for .223 Remington may not have a fast enough rifling to stabilize the longer 5.56×45mm NATO bullets which range up to 77 gr. Some hunting loads of .223 Remington go to 90 grains. 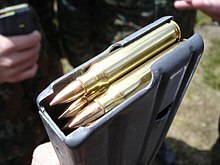 5.56×45mm NATO cartridges in a STANAG magazine. The 5.56×45mm NATO SS109/M855 cartridge (NATO: SS109; U.S.: M855) with standard 62 gr. lead core bullets with steel penetrator will penetrate about 38 to 51 cm (15 to 20 in) into soft tissue in ideal circumstances. As with all spitzer shaped projectiles it is prone to yaw in soft tissue. However, at impact velocities above roughly 762 m/s (2,500 ft/s), it may yaw and then fragment at the cannelure (the crimping groove around the cylinder of the bullet). These fragments can disperse through flesh and bone, inflicting additional internal injuries. Fragmentation, if and when it occurs, imparts much greater damage to human tissue than bullet dimensions and velocities would suggest. This fragmentation effect is highly dependent on velocity, and therefore barrel length: short-barreled carbines generate less muzzle velocity and therefore lose wounding effectiveness at much shorter ranges than longer-barreled rifles. Proponents of the hydrostatic shock theory contend that the shockwave from a high-velocity bullet results in wounding effects beyond the tissue directly crushed and torn by the bullet and fragments. However, others argue that tissue damage from hydrostatic shock is a myth. Critics argue that sonic pressure waves do not cause tissue disruption and that temporary cavity formation is the actual cause of tissue disruption mistakenly attributed to sonic pressure waves. SS109/M855 NATO ball can penetrate up to 3 mm (0.12 in) of steel at 600 meters. According to Nammo, a Finnish-Norwegian ammunition producer, the 5.56×45mm NATO M995 armour piercing cartridge can penetrate up to 12 mm (0.47 in) of RHA steel at 100 meters. The US Army's Ballistic Research Laboratory measured a ballistic coefficient (G7 BC) of 0.151 and form factor (G7 i) of 1.172 for the SS109/M855 ball projectile. There has been much debate of the allegedly poor performance of the bullet on target in regard to stopping power, lethality, and range. Some of this criticism has been used to advocate an intermediate-sized cartridge between the 5.56 and 7.62 NATO sizes while criticisms of lead contamination, poor barrier penetration, and accuracy have been used to support the M855A1 EPR round. Arguably, the criticisms about range, accuracy and lethality are related to the change in barrel length and twist between the M16 and M4. The earlier 5.56 rounds (M855/SS109 and the original M193) were optimized for a 20-inch (51 cm) barrel with a 1:12 twist. The shorter 14.5-inch (37 cm) barrel of the M4 carbine (with a 1:7 twist) generates lower muzzle velocity, reducing the likelihood that the bullet will upset (yaw, fragment, or expand) in the target and resulting in less significant wounds. Combat operations the past few months have again highlighted terminal performance deficiencies with 5.56×45mm 62 gr. M855 FMJ. These problems have primarily been manifested as inadequate incapacitation of enemy forces despite them being hit multiple times by M855 bullets. These failures appear to be associated with the bullets exiting the body of the enemy soldier without yawing and fragmenting. This fragmentation does not occur because the design conforms to international peace treaties such as the Hague convention, which outlaws the use of ammunition that is designed to expand in the body. The ammunition is designed to "yaw" meaning it moves side to side on impact, causing more damage, but it does not always do so, such as when it is fired from a shorter barrel. With normal ammunition with soft lead, hollow, or ballistic tips there will be significant expansion of the bullet on impact that significantly improves its wounding capacity. Some bullets can expand as much as twice their size, but the M855 ball ammunition will only expand a few hundredths of an inch; not enough to effect its performance. This lack of expansion does however help with penetration of light cover such as walls, since the round does not expand it does not experience as much drag and can pass through more wood, thin metal, and other objects than most civilian ammo would be likely to do. Although all SS109/M855 types must be 62 gr. FMJ bullets constructed with a steel penetrator in the nose, the composition, thickness, and relative weights of the jackets, penetrators, and cores are quite variable, as are the types and position of the cannelures. Because of the significant differences in construction between bullets within the SS109/M855 category, terminal performance is quite variable – with differences noted in yaw, fragmentation, and penetration depths. Luke Haag's papers in the AFTE Journal (33(1):11–28, Winter 2001) also describes this problem. If 5.56 mm bullets fail to upset (yaw, fragment, or deform) within tissue, the results are less significant wounds that may not cause adequate blood loss or damage to immediately stop the target's attack or advances . This is true for all 5.56×45mm bullets, including both military FMJ and OTM (open tip match) and civilian JHP/JSP designs used in law enforcement. As expected, with decreased wounding effects, rapid incapacitation is unlikely: enemy soldiers may continue to pose a threat to friendly forces and violent suspects can remain a danger to law enforcement personnel and the public. This failure of 5.56×45mm NATO bullets to yaw can be caused by reduced impact velocities as when fired from short-barreled weapons or when the range to the target increases. Failure to yaw and fragment can also occur when the bullets pass through only minimal tissue, such as a limb or the chest of a thin, small statured individual, as the bullet may exit the body before it has a chance to yaw and fragment. Two other yaw issues: Angle-of-Attack (AOA) variations between different projectiles, even within the same lot of ammo, as well as Fleet Yaw variations between different rifles, were elucidated in 2006 by the Joint Service Wound Ballistic Integrated Product Team (JSWB-IPT), which included experts from the military law enforcement user community, trauma surgeons, aero ballisticians, weapon and munitions engineers, and other scientific specialists. These yaw issues were most noticeable at close ranges and were more prevalent with certain calibers and bullet styles—the most susceptible being 5.56×45mm NATO FMJ ammunition like SS109/M855 and M193. The 5.56×45mm NATO standard SS109/M855 cartridge was designed for maximum performance when fired from a 508 mm (20.0 in) long barrel, as was the original 5.56 mm M193 cartridge. Experiments with longer length barrels up to 610 mm (24.0 in) resulted in no improvement or a decrease in muzzle velocities for the SS109/M855 cartridge. Shorter barrels produce a greater flash and noise signature, and the addition of a suppressor to a short barreled AR family rifle can make it unreliable, as the reduced time for the propellant to burn in the barrel and higher muzzle pressure levels at the suppressor entrance can cause faster cycling and feeding issues. Unless the gas port can be regulated or adjusted for higher pressures, suppressors for short barreled 5.56×45mm NATO firearms must be larger and heavier than models for standard length rifles to function reliably. SS109/M855 cartridges fired from barrels under about 254 mm (10.0 in) in length do not have enough muzzle velocity energy to cause extreme damage that occurs only at terminal velocities of over 750 m/s (2,500 ft/s) on impact, reducing the wounding capacity. Compared to larger calibers, proponents of the 5.56×45mm NATO round contend that animal studies of the wounding effects of the 5.56×45mm NATO round versus the 7.62×39mm have found that the 5.56×45mm NATO round is more damaging, due to the post-impact behavior of the 5.56 mm projectile resulting in greater cavitation of soft tissues. The US Army contended in 2003 that the lack of close range lethality of the 5.56×45mm NATO was more a matter of perception than fact. With controlled pairs and good shot placement to the head and chest, the target was usually defeated without issue. The majority of failures were the result of hitting the target in non-vital areas such as extremities. However, a minority of failures occurred in spite of multiple hits to the chest. Some have contended that shot placement is the most important parameter in determining the lethality of a bullet. Difficulty with the 5.56×45mm NATO at long ranges has been attributed to training [not in citation given]; Swedish ISAF units relied on .50 BMG heavy machine guns for long-range shooting due to resilience to factors such as range and wind drift. Underperformance is thus attributed to errors in range and wind estimation, target lead, firing position, and stress under fire, factors that can be resolved through training. Advances have been made in 5.56 mm ammunition. The U.S. military had adopted for limited issue a 77-grain (5.0 g) "Match" bullet, type classified as the Mk 262. The heavy, lightly constructed bullet fragments more violently at short range and also has a longer fragmentation range. Originally designed for use in the Mk 12 SPR, the ammunition has found favor with special forces units who were seeking a more effective cartridge to fire from their M4A1 carbines. Commercially available loadings using these heavier (and longer) bullets can be prohibitively expensive and cost much more than military surplus ammunition. Additionally, these heavy-for-caliber loadings sacrifice some penetrative ability compared to the M855 round (which has a steel penetrator tip). Performance of 5.56×45mm military ammunition can generally be categorized as almost entirely dependent upon velocity in order to wound effectively. Heavy OTM bullets enhance soft tissue wounding ability at the expense of hard-target/barrier penetration. U.S. Special Forces had sought to create a round that had increased power out of carbine M4 barrels and compact SCAR-L barrels, while increasing hard target performance. Developmental efforts led to the creation of the Mk318. The bullet uses an open-tip design to inflict damage on soft tissue, and has a brass rear to penetrate hard targets. The tip and lead core fragments consistently even when using short barrels, while the rear moves through once the front impacts. It has more consistent performance because it is not yaw-dependent like the M855; the nose fragments upon impact and solid rear penetrator continues to move relatively straight. This makes the Mk318 effective against personnel with or without body armor. The round also increases accuracy, from 3–5 minute of angle (MOA) with the M855 from an M4A1 barrel to 1.71 MOA at 300 yards and 1.67 MOA at 600 yards from a 14 in (360 mm) SCAR-L barrel. For general issue, the U.S. Army adopted the M855A1 round in 2010 to replace the M855. The primary reason was pressure to use non-lead bullets. The lead slug is replaced by a copper alloy slug in a reverse-drawn jacket, with a hardened steel penetrator extending beyond the jacket, reducing lead contamination to the environment. The M855A1 offers several improvements other than being lead-free. It is slightly more accurate, has better consistency of effect in regards to wounding ability, and has an increased penetrating capability. The round can better penetrate steel, brick, concrete, and masonry walls, as well as body armor and sheet metal. It penetrates 3⁄8 in (9.5 mm) of mild steel at 350 meters, which the M855 can only do at 160 meters. The propellant burns faster, which decreases the muzzle flash and gives a higher muzzle velocity, an important feature when fired from a short barreled M4 carbine. Though the M855A1 is more expensive to produce, its performance is considered to compensate. One possible danger is that it generates much greater pressure in the chamber when fired, decreasing service life of parts and increasing the risk of catastrophic failure of the weapon (though this has yet to occur). The U.S. Marines adopted the Mk318 in early 2010 due to delays with the M855A1. This was a temporary measure until the M855A1 was available for them, which occurred in mid-2010 when the Army began to receive the rounds. Both the Mk318 and M855A1 weigh the same and have similar performance, and both have better performance than the M855 against all targets. SOCOM spent less money developing the Mk318 and it is marginally better than the M855A1 in some situations, but costs more per round. The Army spent more developing the M855A1 which performs as well or nearly as well as the Mk318, but is cheaper per round and has the advantage of being lead-free. While SOCOM constantly looks for better equipment, the Army and Marines have far more troops to supply and buy more ammunition than SOCOM. If the 5.56 mm bullet is moving too slowly to reliably yaw, expand, or fragment on impact, the wound size and potential to incapacitate a person is greatly reduced. There have been numerous attempts to create an intermediate cartridge that addresses the complaints of 5.56 NATO's lack of stopping power along with lack of controllability seen in rifles firing 7.62 NATO in full auto. Some alternative cartridges like the .270 caliber 6.8mm Remington SPC (6.8×43mm) focused on superior short-range performance by sacrificing long-distance performance due to the relatively short engagement distances typically observed in urban warfare. Others, like the 6.5mm Grendel (6.5×39mm), are attempts at engineering an all purpose cartridge that could replace both the 5.56 and 7.62 NATO rounds. The 300 AAC Blackout (7.62×35mm) round was designed to have the power of the 7.62×39mm for use in an M4 using standard M4 magazines, and to easily interchange between subsonic ammunition for suppressed firing and supersonic rounds. All these cartridges have certain advantages over the 5.56×45mm NATO, but they have their own individual tradeoffs to include lower muzzle velocity and less range. Additionally, when using a round not based on the case of the 5.56 there can be decreased magazine capacity, and different internal parts. None of these cartridges have gained any significant traction beyond sport shooting communities. By late 2004, the 6.8mm Remington SPC was in limited use with U.S. Special Operators. However, it was not adopted for widespread use due to resistance from officials on changing calibers. In 2007, both the U.S. SOCOM and the U.S. Marine Corps decided not to field weapons chambered in 6.8×43mm due to logistical and cost issues. An unnamed LWRC representative said in January 2014 that the US military is once again taking a look at the 6.8 SPCII after all the commercial development in the last 10 years. The exterior dimensions of the 5.56mm NATO and .223 Remington cartridges are identical. While the cartridges are identical other than powder load, the chamber leade, i.e. the area where the rifling begins, is cut to a sharper angle on some .223 commercial chambers. Because of this, a cartridge loaded to generate 5.56mm pressures in a 5.56mm chamber may develop pressures that exceed SAAMI limits when fired from a short-leade .223 Remington chamber. The dimensional specifications of 5.56 NATO and .223 commercial brass cases are identical. The cases tend to have similar case capacity when measured, with variations chiefly due to brand, not 5.56 vs .223 designation. The result of this is that there is no such thing as "5.56 brass" or ".223 brass", the differences in the cartridges lie in pressure ratings and in chamber leade length, not in the shape or thickness of the brass. In July 2012, the Army solicited a request for vendors to supply alternative cartridge cases to reduce the weight of an M855A1 5.56 mm round by at least 10 percent, as well as for the 7.62 NATO and .50 BMG rounds. The cartridge cases must maintain all performance requirements when fully assembled, be able to be used by the Lake City Army Ammunition Plant, must be manufactured in quantities totaling approximately 45 million per year. Polymer-cased ammunition is expected as a likely lightweight case technology. A hybrid polymer/metal version of a conventional cartridge case would be thicker than regular cases and reduce the amount of space for the propellant, although certain polymers could be thermodynamically more efficient and not lose energy to the case or chamber when fired. C.I.P. defines the maximum service and proof test pressures of the .223 Remington cartridge equal to the 5.56mm NATO, at 430 MPa (62,366 psi). This differs from the SAAMI maximum pressure specification for .223 Remington of 380 MPa (55,114 psi), due to CIP test protocols measuring pressure using a drilled case, rather than an intact case with a conformal piston, along with other differences. NATO uses NATO EPVAT pressure test protocols for their small arms ammunition specifications. Differences in testing methodology have led to widespread confusion, however when measured with identical measuring equipment using identical methodologies, .223 Remington yields peak average pressures about 5,000 psi lower than 5.56 NATO. The 5.56mm NATO chamber, known as a NATO or mil-spec chamber, has a longer leade, which is the distance between the mouth of the cartridge and the point at which the rifling engages the bullet. The .223 Remington chamber, known as SAAMI chamber, is allowed to have a shorter leade, and is only required to be proof tested to the lower SAAMI chamber pressure. To address these issues, various proprietary chambers exist, such as the Wylde chamber (Rock River Arms) or the ArmaLite chamber, which are designed to handle both 5.56×45mm NATO and .223 Remington equally well. The leade of the .223 Remington minimum C.I.P. chamber also differs from the 5.56mm NATO chamber specification. The casings and chambers .223 Remington and 5.56×45mm NATO are virtually the same dimensions, but due to the fact that .223 Remington is designed to handle much lower pressures than the 5.56×45mm NATO the rounds are not completely interchangeable. Firing a 5.56×45mm NATO round out of a rifle chambered in .223 Remington could be injurious or fatal to the user as well as the gun, however .223 Remington ammunition can be fired safely from almost any rifle chambered in 5.56×45mm NATO as the NATO specified rifles can handle much more chamber pressures than the .223 Remington is capable of producing. Using commercial .223 Remington cartridges in a 5.56mm NATO chambered rifle should work reliably, but until recently, it was believed this was less accurate than when fired from a .223 Remington chambered gun due to the longer leade. Although that may have been true in the early 1960s when the two rounds were developed, recent testing has shown that with today's ammunition, rifles chambered in 5.56×45mm NATO can also fire .223 ammunition every bit as accurately as rifles chambered in .223 Remington, and the 5.56×45mm NATO chamber has the additional advantage of being able to safely fire both calibers. Using 5.56×45mm NATO mil-spec cartridges (such as the M855) in a .223 Remington chambered rifle can lead to excessive wear and stress on the rifle and even be unsafe, and SAAMI recommends against the practice. Some commercial rifles marked as ".223 Remington" are in fact suited for 5.56×45mm NATO, such as many commercial AR-15 variants and the Ruger Mini-14 (marked ".223 cal", except the Mini-14 "Target" model, which only fires .223), but the manufacturer should always be consulted to verify that this is acceptable before attempting it, and signs of excessive pressure (such as flattening or gas staining of the primers) should be looked for in the initial testing with 5.56×45mm NATO ammunition. The upper receiver (to which the barrel with its chamber are attached) and the lower receiver are entirely separate parts in AR-15 style rifles. If the lower receiver has either .223 or 5.56 stamped on it, it does not guarantee the upper assembly is rated for the same caliber, because the upper and the lower receiver in the same rifle can, and frequently do, come from different manufacturers – particularly with rifles sold to civilians or second-hand rifles that have been repaired with spare parts. Since all parts are interchangeable, a shooter MUST take great caution to check for markings of 5.56×45mm on the barrel before attempting to fire 5.56×45mm NATO ammunition out of it. In more practical terms, as of 2010[update] most AR-15 parts suppliers engineer their complete upper assemblies (not to be confused with stripped uppers where the barrel is not included) to support both calibers in order to satisfy market demand and prevent any potential problems. The first confrontations between the AK-47 and the M14 rifle came in the early part of the Vietnam War. Battlefield reports indicated that the M14 was uncontrollable in full-auto and that soldiers could not carry enough ammo to maintain fire superiority over the AK-47. A replacement was needed, as a result, the Army was forced to reconsider a 1957 request by General Willard G. Wyman, commander of the U.S. Continental Army Command (CONARC) to develop a .223 caliber (5.56 mm) select-fire rifle weighing 6 lbs (2.7 kg) when loaded with a 20-round magazine. This request ultimately resulted in the development of a scaled-down version of the Armalite AR-10, called ArmaLite AR-15 rifle. During testing it was found that a 5- to 7-man team armed with the ArmaLite AR-15s has the same firepower as 11-man team armed with M14s. Also, soldiers armed with ArmaLite AR-15s could carry nearly three times more ammunition as those armed with M14s (649 rounds vs 220 rounds). The ArmaLite AR-15, officially designated Rifle, Caliber 5.56 mm, M16, was later adopted by U.S. infantry forces as the standard issue rifle. Here is a table comparing rifles based on a maximum ammunition load in box magazines of 10 kg (22 lb). 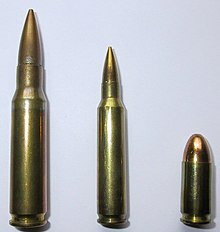 Comparison of 7.62mm NATO, 5.56mm NATO and 9mm Parabellum. Hit probability refers to the ability of a soldier to concentrate on firing in spite of their weapon's recoil and noise, which is noticeably different between the two cartridges. The 7.62 NATO has twice the impact energy of the 5.56 NATO, preferable if a target is protected by higher level armor, especially at "medium" range. If not, both rounds normally penetrate satisfactorily through enemies up to 600 meters, approximately. A 5.56 NATO round fired from a 20 in (510 mm) barrel has a flatter trajectory than a 7.62 NATO round fired from a barrel of equal length, while the 5.56 NATO fired from a 14.5 in (370 mm) barrel has the same trajectory as the 7.62 NATO from a 20 in barrel, as well as the same time of flight. A 7.62 NATO round reaches 50 percent of its velocity within 80 mm (3.1 in) of the barrel when fired, so decreasing the barrel length for close quarters combat results in increased muzzle pressure and greater noise and muzzle flash. Cartridge, Ball, F1 (1985-2010? ): 5.56×45mm FN SS109 equivalent produced by Thales Australia, formerly Australian Defence Industries (ADI). Cartridge, Ball, F1A1 [Green tip] (2010–present): 5.56×45mm with optimized projectile having a modified boat tail length and meplat diameter, redesigned case thickness, new primer cup design, and AR2210V01 propellant. Unlike the F1 cartridge, the F1A1 headstamp has a dimple at 3 o'clock and 9 o'clock. This is a hallmark of the automated SCAMP loading machinery used to make the new cartridges. Cartridge, Blank, F3 [Crimped tip] (1985-1994; 1998–Present): 5.56×45mm Blank cartridge produced by Thales Australia, formerly Australian Defence Industries (ADI). Due to low demand lots are made every three years. Cartridge, Ball, SS109: 5.56×45mm 61-grain [3.95 g] Semi-Armor-Piercing cartridge w/. steel penetrator produced by Fabrique Nationale. Adopted in 1979 as the NATO standard. Cartridge, Ball, C77: 5.56×45mm FN SS109 equivalent used in the C7, C8 and C9 type weapons. Made by General Dynamics Canada. Cartridge, Blank, C79 [Crimped tip]: 5.56×45mm blank cartridge used in the C7, C8 and C9 type weapons. Also made by General Dynamics Canada. Cartridge, Ball, DM11 [Green tip]: 5.56×45mm 4.1 g dual core ball cartridge w/steel core, produced by RUAG Ammotec. Cartridge, Tracer, DM21 [Orange tip]: 5.56×45mm tracer compliment to DM11, also produced by RUAG Ammotec. Cartridge, 5.56×45mm, Ball, M1A3 (South Africa): 55-grain FMJ Ball round based on the M193 cartridge. It is used with the R4/5/6 series assault rifles. 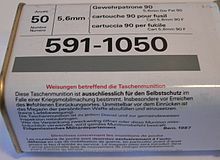 5,6mm Gw Pat 90: The 63-grain 5.56×45mm Gewehrpatrone 90 / 5,6mm GP 90 ("5.6-mm Rifle Cartridge 90") is the Swiss Army's standard 5.56mm Ball round. It is optimized for use with the Sturmgewehr 90 service rifle, both which were adopted in 1987. Originally the cartridge had a cupro-nickel jacketed bullet and Berdan primer, but it now has a tombac jacketed bullet and lead-free Boxer primer. Since 1997 most components of the round are made in Switzerland. Cartridge, Ball, L2A1: 5.56×45mm M193 equivalent produced by Radway Green. Round, Ball, L2A2: 5.56×45mm FN SS109 equivalent produced by Radway Green. Round, Tracer, L1A1 [Red tip]: 5.56×45mm tracer compliment to L2A1, produced by Radway Green. Round, Tracer, L1A2 [Red tip]: 5.56×45mm tracer compliment to L2A2, produced by Radway Green. Round, Blank, L1A1 & L1A2 [crimped tip]: 5.56×45mm blank training round, produced by Radway Green. Round, Drill, L1A1 [chromed body]: 5.56×45mm inert training round, produced by Radway Green. M855 and M856 cartridges in an ammunition belt using M27 disintegrating links. Cartridge, Caliber 5.56 mm, Ball, M193: 5.56×45mm 55-grain [3.56 g] ball cartridge. This was type-standardized and designated by the US Army in September, 1963. Cartridge, Caliber 5.56 mm, Grenade, M195 [Crimped tip with Red lacquer seal]: 5.56×45mm high-pressure grenade-launching blank. Cartridge, Caliber 5.56 mm, Tracer, M196 [Red or Orange tip]: 5.56×45mm 54-grain [3.43 g] tracer cartridge. Cartridge, Caliber 5.56 mm, High Pressure Test (HPT), M197 [stannic-stained or nickel-plated case]: High-pressure Testing cartridge used when proofing weapons during manufacture, test, or repair. Cartridge, Caliber 5.56 mm, Dummy, M199 [No primer, Fluted case]: 5.56×45mm inert cartridge with fluted indentations in the case. Used for loading and unloading drills during basic training. Cartridge, Caliber 5.56 mm, Blank, M200 [Crimped tip with Violet lacquer seal]: 5.56×45mm training blank cartridge. Cartridge, Caliber 5.56 mm, Ball, M202: 5.56×45mm 58-grain FN SSX822 cartridge. Cartridge, Caliber 5.56 mm, Dummy, M232 [No primer, Black-anodized case and bullet]: 5.56×45mm inert cartridge. Used for testing rifle mechanisms. Cartridge, Caliber 5.56 mm, Ball, XM287: 5.56×45mm 68-grain ball cartridge produced by Industries Valcartier, Inc. An Improved version was also produced designated XM779. Cartridge, Caliber 5.56 mm, Tracer, XM288: 5.56×45mm 68-grain tracer cartridge produced by Industries Valcartier, Inc. An Improved version was also produced designated XM780. Cartridge, Caliber 5.56 mm, Grenade, M755 [Crimped tip with Yellow lacquer seal]: 5.56×45mm grenade launching blank specifically for the 64mm M234 launcher. The original white lacquer seal was discontinued due to excessive bore fouling. Cartridge, Caliber 5.56 mm, Ball, XM777: 5.56×45mm ball cartridge. An attempt to create a 55-grain SS109-style Semi-Armor-Piercing round that weighed the same as the M193 and could use the same US-standard 1-in-12-inch rifling. It replaced the 6×45mm SAW round as the baseline cartridge for the Squad Automatic Weapon trials in the late 1970s and early 1980s. Cartridge, Caliber 5.56 mm, Tracer, XM778: 5.56×45mm tracer cartridge mated with the XM777 Semi-Armor-Piercing cartridge. Cartridge, Caliber 5.56 mm, Ball, M855 [Green tip]: 5.56×45mm 62-grain FN SS109-equivalent ball cartridge with a steel penetrator tip over a lead core in a full copper jacket. Cartridge, Caliber 5.56 mm, Ball, M855LF Lead Free [Green tip]: 62-grain bullet with a steel penetrator tip over a tungsten-composite core in a full copper jacket. Primarily used during training in countries with strict lead disposal laws. Cartridge, Caliber 5.56 mm, Ball, M855A1 Enhanced Performance Round [unpainted steel penetrator tip] (2010–Present): 62-grain bullet w/ a 19-grain steel penetrator tip over a copper alloy core in a partial copper jacket. Cartridge, Caliber 5.56 mm, Tracer, M856 [Orange tip]: 5.56×45mm 63.7-grain FN L110 tracer cartridge. Provides red visible light and lacks a steel penetrator. 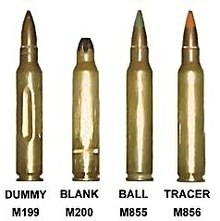 Cartridge, Caliber 5.56 mm, Tracer, M856A1 [Red tip]: 5.56×45mm 56-grain Lead Free slug (LF) Tracer with similar ballistic performance to the M855A1 and improved trace to range consistency. Cartridge, Caliber 5.56 mm, Plastic, Practice, M862 [Brass primer, Aluminum case and Blue plastic projectile]: Short Range Training Ammo (SRTA) has a smaller charge than standard ball, reducing its aimed range to 250 meters, and fires a plastic bullet. The M2 training bolt must be used in the M16 Rifle / M4 Carbine when using SRTA for the weapon to cycle properly due to its lower power. It is used during training on shooting ranges near built-up or populated areas. Cartridge, Caliber 5.56 mm, Armor Piercing, M995 [Black tip]: 5.56×45mm 52-grain AP cartridge with a tungsten core. Cartridge, Caliber 5.56 mm, Tracer, XM996 [Crimson tip]: So-called "Dim Tracer" with reduced effect primarily for use with night vision devices. Cartridge, Caliber 5.64 mm, Ball, MLU-26/P (National Stock Number:1305-968-5892): Munition, Live, Unit #26 / Personnel use. Early USAF designation for a 55-grain 5.56×45mm FMJ Boat-Tailed ball cartridge produced by Remington-Union Metallic Cartridge Company (headstamp RA 63 or REM-UMC 63) in January, 1963. It was their designation for the commercial 55-grain .223 Remington M.C. ("Metallic-Cased", or Full Metal Jacketed) cartridge, which the Air Force initially designated "5.64 mm" rather than 5.56 mm. The order consisted of 8.5 million rounds and was procured for testing, training and unconventional warfare use with the XM16 rifle. The cartridges came packed unclipped in white 20-round commercial ammunition boxes. Cartridge, Caliber 5.56 mm, Frangible, MK 255 Mod 0 [White Tip]: 5.56×45mm 62-grain Reduced Ricochet Limited Penetration (RRLP) round with copper/polymer composite core for training and operational use. Cartridge, Caliber 5.56 mm, Special Ball, Long Range, Mk 262 Mod 0/1: 5.56×45mm 77-grain Open-Tipped Match/Hollow-Point Boat-Tail cartridge. Mod 0 features Sierra Matchking bullet, while Mod 1 features either Nosler or Sierra bullet. Cartridge, 5.56×45mm, semi-jacketed Frangible, MK 311 Mod 0 : Reduced Ricochet Limited Penetration (R2LP) round, 50-grain frangible bullet intended for training. Produced by Western Cartridge Company (headstamp: WCC). Cartridge, Caliber 5.56 mm Ball, Enhanced 5.56 mm Carbine, MK318 MOD 0: 5.56×45mm 62-grain Open-Tipped Match Boat-Tail cartridge. Optimized for use with 14-inch barreled weapons like the M4A1 Carbine and MK16 SCAR and designed to penetrate light barriers like windshields or car doors with no loss of accuracy or damage. Now designated as Caliber 5.56 mm Ball, Carbine, Barrier. In 1970, NATO decided to standardize a second rifle caliber. Tests were conducted from 1977 to 1980 using U.S. XM777 5.56 mm, Belgian SS109 5.56 mm, British 4.85×49mm, and German 4.7×33mm caseless. No weapon could be agreed upon, as many were prototypes, but the SS109 was found to be the best round and standardized on October 28, 1980. The SS109 was developed in the 1970s for the FN FNC rifle and the FN Minimi machine gun. To increase the range of the Minimi, the round was created to penetrate 3.5 mm of steel at 600 meters. The SS109 had a steel tip and lead rear and was not required to penetrate body armor. Barrels required at least a 1:9 in rifle twist, but needed a 1:7 in rifle twist to fire tracer ammunition. The U.S. designated the SS109 cartridge the M855 and first used it in the M16A2 rifle. The 62-grain round was heavier than the previous 55-grain M193. While the M855 had better armor penetrating ability, it is less likely to fragment after hitting a soft target. This lessens kinetic energy transfer to the target and reduces wounding capability. The M855 is yaw dependent, meaning it depends on the angle upon which it hits the target. If at a good angle, the round turns as it enters soft tissue, breaking apart and transferring its energy to what it hits. If impacting at a bad angle, it could pass through and fail to transfer its full energy. The SS109 was made to pierce steel helmets at long range from the Minimi, not improve terminal performance on soft tissue from rifles or carbines. In Iraq, troops that engaged insurgents at less than 150 yards found that M855 rounds did not provide enough stopping power. In addition to not causing lethal effects with two or more rounds, they did not effectively penetrate vehicle windshields, even with many rounds fired at extremely close range. In Afghanistan, troops found that M855 rounds also suffered at long ranges. Although 5.56 mm rifles have an effective range of 450–600 meters, the M855 bullet's performance falls off sharply beyond 300 meters. The ranges are even shorter for short-barreled carbines. Half of small-arms attacks were launched from 300–900 meter ranges. An M855 fired from an M4 Carbine has severely degraded performance beyond 150 meters. The maximum effective point target range of an M4 carbine with M855 rounds is 500 m (547 yd), with a maximum effective area target range of 600 m (656 yd). These mark the greatest distances the rounds can be expected to accurately hit the target, not the ranges that they have terminal effectiveness against them. Because the M855 is yaw dependent it requires instability in flight to deform upon hitting the target. It is the most stable in flight between 150–350 m (164–383 yd), potentially lessening its effectiveness if it strikes an enemy between those distances. In addition to this, tests have shown that 5.56 mm bullets fragment most reliably when traveling faster than 2,500 ft/s (760 m/s). From full-length 20 in (508 mm) rifle and machine gun barrels, rounds exhibit velocities above 2,500 ft/s (760 m/s) out to 200 m (219 yd). An M855 fired from a shorter barreled M4 carbine exhibits a bullet velocity of 2,522 ft/s (769 m/s) at 150 m (164 yd) range. Even if it impacts at optimum speeds, 70 percent of 5.56 mm bullets will not begin to yaw until 4.7 in (120 mm) of tissue penetration. 15 percent more begin to yaw after that distance, so up to 85 percent of rounds that hit do not start to fragment until nearly 5 in of penetration. Against small statured or thin combatants, the M855 has little chance of yawing before passing through cleanly and leaving a wound cavity no bigger than the bullet itself. The factors of impact angle and velocity, instability distance, and penetration before yaw reduce the round's predictable effectiveness considerably in combat situations. M855A1 Enhanced Performance Round and its environmentally friendly (lead-free) projectile. The M855A1 Enhanced Performance Round (EPR) was introduced in June 2010. It features a lead-free projectile with a solid copper core, and is tailored for use in rifles with shorter barrels such as the M4 carbine. It provides more consistent performance compared to the M855. In mid-2005, a meeting was held at the Lake City Army Ammunition Plant as part of Phase II of the U.S. Army's Green Ammunition replacement program and attended by representatives from several military sectors and contractors. The objective was to create an environmentally friendly small arms training round after the Army had been required, in part by stronger state regulations, to remove lead from their bullets to reduce lead accumulation at stateside training ranges. Initially, Phase I efforts created the M855 "green tip" 5.56 mm round that replaced the lead core with one made of tungsten, but it was found that the round would become unstable in flight and fly sideways through a target; furthermore, research was suggesting that tungsten was not environmentally better than lead. Phase II efforts focused on creating an alternative round that did not contain either metal. As the Iraq War was happening at the same time, participants decided to use the opportunity to redirect their efforts from just making a "green" training round to creating an entirely new general-purpose rifle round to address complaints encountered in the field. Complaints had surfaced about the poor lethality of standard M855 rounds against soft targets, although while some units claimed they had virtually no effect others said they were having no problems. The problem was "yaw sensitivity," where rounds experiencing swing in flight have varying effects when they hit a target based on the degree of yaw, resulting in unpredictable lethality effects. The makeup and design of the bullet affected accuracy. The copper jacket is formed first at the point, then a steel penetrator is inserted into the jacket and the projectile is crimped shut. Error in the penetrator placement can change flight performance and affect dispersion, and the rearward-drawn jacket can create an uneven boat tail leading to uneven airflow and more affected dispersion. It also was not optimized for use in short-barreled rifles. The M855 was originally made to burn and accelerate from the 20 in (510 mm) barrel of the M249 SAW; then it was repurposed to the M16A2 for ammunition compatibility. When fired from a short-barreled M4, lower muzzle velocity led to decreased terminal effectiveness, and unburned propellant fired from the end of the barrel created a brighter muzzle flash and caused more combustion debris to be pushed back in the gas tube, dirtying the weapon. Alternative 5.56 mm rounds in use were considered, like the Mk 262 open-tipped match cartridge. The Mk 262 was more accurate and had better soft target performance, and both Army and Marine units were using large quantities in Iraq deployments for designated marksman rifles. However, the Mk 262 was not adequate as a general-purpose round and cost four times more than the M855, so it could not be produced at the volumes required for 5.56 mm ammunition (up to 1 billion rounds annually). It was also found that performance suffered when fired from standard barrels, so match grade barrels would be needed for optimum performance. The M995 armor-piercing round had high accuracy and target penetration, but was eight times more expensive than the M855. Commercial alternatives were found to have the same yaw sensitivity issues as the M855. A number of objectives were desired for the new round, including more lethal, or at least more consistent, soft target effects and less shot dispersion. It must not be specialized for any one task to have general-purpose performance, and if improvement in any one area resulted that would be considered a secondary benefit. As the services were purchasing large numbers of optics, it could not require a different reticle pattern, but re-zeroing sights would be acceptable. Optimization for short-barreled rifles was needed, as the Army and Special Forces' main weapon was the M4 carbine; a flash-suppressed propellant was also required. Optimizing the round to perform within the pressure limits for short barrels would cause performance loss in longer barrels (causing complaints from the Marine Corps), but analysis showed that a short barrel-optimized round would have less performance loss fired from a long barrel than vice versa. The round also had to be cost-competitive and meet environmental standards. The initial M855A1 design began testing in late 2007. Its alloy core had no toxic metals and could be cheaply produced. Materials and production methods, like a reverse-drawn jacket for a clean boat tail, led to yaw insensitivity, improved soft target performance, and consistent dispersion. The steel penetrator was retained and, through greater velocity and better composition and placement, substantially improved hard target performance. It met short-barrel optimization, ballistic similarity, and producibility requirements; it cost slightly more than the M855, but far less than the Mk 262. Production prove-out testing would take time, as over a million rounds had to be test-fired to ensure instances of failure would not occur at the 1 billion rounds per year scale. As information began to be made public, the original program objective to create a "green round" led to confusion and criticism that the Army was focusing more on environmental safety than on performance. Just as testing was being completed and the first production lots were being prepared in August 2009, the rounds with the experimental bismuth-tin alloy core were found to fail at high temperatures. This caused a one-year delay to replace the bullet core with one of solid copper, which solved the temperature problem and also improved cost and producibility. On June 24, 2010, the United States Army announced it began shipping its new 5.56 mm cartridge, the M855A1 Enhanced Performance Round (EPR), to active combat zones. During testing, the M855A1 performed better than M80 7.62×51mm NATO ball ammunition against certain types of targets (particularly hardened steel). However, this was due to the addition of the steel penetrator to the M855A1 projectile compared to the standard lead-alloy core of the M80 projectile and is not an accurate comparison between the two cartridges. The US Army Picatinny Arsenal stated that the new M855A1 offers improved hard target capability, more consistent performance at all distances, enhanced dependability, improved accuracy, reduced muzzle flash, and higher velocity compared to the SS109/M855 round. Further, the Army stated the new M855A1 ammunition is tailored for use in M4 carbines, but should also give enhanced performance in M16 rifles and M249 light machine guns. The new 62-grain (4 g) projectile used in the M855A1 round has a copper core with a 19-grain (1.2 g) steel "stacked-cone" penetrating tip. The M855A1 cartridge is sometimes referred to as "green ammo" because it fires a lead free projectile. It is not necessarily more lethal than the SS109/M855, but performs more consistently every time it hits a soft target and retains its performance at longer distances. The EPR can penetrate a 3⁄8 in (9.5 mm) thick mild steel barrier from an M4 at 350 m (380 yd) and from an M16 at 400 m (440 yd). Compared to the SS109/M855 the M855A1 muzzle velocities are somewhat increased to 3,150 ft/s (960 m/s) (+37 ft/s (11 m/s)) for the M16 and 2,970 ft/s (910 m/s) (+54 ft/s (16 m/s)) for the M4 carbine. Ballistics for both rounds are similar and don't require weapons to be re-zeroed, but if they are the EPR can be slightly more accurate. The steel-tip penetrator of the M855A1 is noticeably separated from the jacket of the bullet and can spin, but this is part of the design and does not affect performance. The M855A1 costs only 5 cents more per round than the M855. 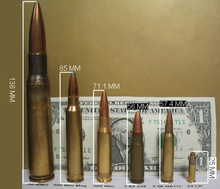 The M855A1 bullet has a 1⁄8 in (3.2 mm) greater length than the SS109/M855. Because steel and copper are less dense than lead, the bullet is lengthened inside the case to achieve the same weight as its predecessor. The longer bullet and reverse-drawn jacket make it more stable and accurate in-flight. Its steel tip is exposed from the jacket and bronzed for corrosion resistance. The tip is serrated and larger than the M855's steel tip. The M855A1's bullet composition, better aerodynamics, and higher proof pressures give it an extended effective range for penetration and terminal performance. While effectiveness at different ranges is increased, the M855A1 does not increase the effective ranges at which weapons are expected to hit their targets. The Enhanced Performance Round was made to nearly match the trajectory of the M855 to aid in training consistency—the SS109/M855 ballistic coefficient (G7 BC) of 0.151 was improved to 0.152 for the M855A1—but the ranges to get desired effects are greatly extended. The United States Marine Corps purchased 1.8 million rounds in 2010, with plans to adopt the round to replace the interim MK318 SOST rounds used in Afghanistan when the M855A1 project was delayed. The Marine Corps plans to adopt the M855A1 round in 2018; although testing revealed it caused "some durability issues" with the Marines' M27 Infantry Automatic Rifle, the weapon is still "operationally suitable" when firing the round. On a media day at Aberdeen Proving Ground on May 4, 2011, reports were given about the M855A1's performance in the field since it was issued 11 months earlier. One primary advantage given by the round is its consistent performance against soft targets. While the older SS109/M855 was yaw-dependant, which means its effectiveness depends on its yaw angle when it hits a target, the M855A1 delivers the same effectiveness in a soft target no matter its yaw angle. The new SMP-842 propellant in the round burns quicker in the shorter M4 carbine barrel, ensuring less muzzle flash and greater muzzle velocity. The M855A1 was able to penetrate 3⁄8 inch (9.5 mm) of mild steel plate at 300 m (330 yd). The round even penetrated concrete masonry units, similar to cinder blocks, at 75 m (82 yd) from an M16 and at 50 m (55 yd) from an M4, which the M855 could not do at those ranges. Its accuracy is maintained and sometimes increased, as it was able to shoot a group 2 inches better at 600 m (660 yd). February 2011 was the first time the M855A1 was used more than the M855, and approximately 30 million M855A1 rounds have been fielded from June 2010 to May 2011. The M855A1 was put to the test at the 2012 National Rifle Association's National High-Power Rifle Championship at Camp Perry, Ohio in August 2012. The shooter for the Army was Rob Harbison, a contractor supporting small caliber ammunition capability development at Fort Benning Georgia. This was a special event for the Project Manager for Maneuver Ammunition Systems and the Army's Maneuver Center of Excellence as it was an opportunity to showcase the capabilities of the Enhanced Performance Round. With an M16 loaded with M855A1 ammo, Harbison fired a perfect 200 points in the Coast Guard Trophy Match, which is 20 shots fired from the sitting position at 200 yards, finishing 17th out of 365 competitors. He also scored a perfect 100 on the final string of ten shots during the Air Force Cup Trophy Match, fired at 600 yards from the prone position, which is 10 shots in a row within the 12-inch, 10-point ring at 600 yards with combat ammunition. Harbison was happy with the performance of the EPR, with his scores showing that the Army's newest general purpose round is accurate enough to go toe-to-toe in the competition with the best ammo that can be bought or hand-loaded. Harbison even said, "I don't think I could have scored any higher if I was using match-grade competition ammunition." The M855A1 was not fired from 1:7 in rifled barrels used in standard Army rifles, but special Army Marksmanship Unit (AMU) match-grade 1:8 in rifled barrels, which produce more accurate results when firing 62-grain rounds. From fielding in June 2010 to September 2012, Alliant Techsystems delivered over 350 million M855A1 Enhanced Performance Rounds. Since its introduction, the M855A1 has been criticized for its St. Mark's SMP842 propellant causing increased fouling of the gun barrel. Post-combat surveys have reported no issues with the EPR in combat. A series of tests found no significant difference in fouling between the old M855 and the M855A1. However, manufacturers have reported "severe degradation" to barrels of their rifles using the M855A1 in tests. The Army attributes pressure and wear issues with the M855A1 to problems with the primer, which they claim to have addressed with a newly designed primer. It uses a modified four-pronged primer anvil for more reliable powder ignition, with a stab crimp rather than a circumferential crimp to better withstand the new load's higher chamber pressure, increased from 55,000 psi (379.2 MPa) to 62,000 psi (427.5 MPa). During Army carbine testing, the round caused "accelerated bolt wear" from higher chamber pressure and increased bore temperatures. Special Operator testing saw cracks appear on locking lugs and bolts at cam pin holes on average at 6,000 rounds, but sometimes as few as 3,000 rounds during intense automatic firing. Firing several thousand rounds with such high chamber pressures can lead to degraded accuracy over time as parts wear out; these effects can be mitigated through a round counter to keep track of part service life. Weapons with barrel lengths shorter than the M4 firing the M855A1 also experience 50 percent higher pressures than a full-length M16 rifle barrel, which can cause port erosion that can boost the automatic fire rate, increasing the likelihood of jams. From June 2010 to June 2013, issuing of the M855A1 Enhanced Performance Round removed 1,994 metric tons of lead from the waste stream. 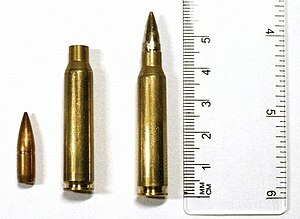 2.1 grams (32 gr) of lead are eliminated from each M855A1 projectile. The Mk 262 is a match-quality round manufactured by Black Hills Ammunition made originally for the Special Purpose Rifle (SPR). It uses a 77-grain (5.0 g) Sierra MatchKing bullet that is more effective at longer ranges than the standard issue M855 round. In 1999, SOCOM requested Black Hills Ammunition to develop ammunition for the Mk 12 SPR that SOCOM was designing. For the rifle to be accurate out to 700 yards, Black Hills "militarized" a cartridge that used the Sierra 77 grain OTM (Open Tip Match) projectile; it switched from a .223 Remington to 5.56 mm case, increased pressure loading, crimped and sealed the primer, and added a flash retardant to the powder. The Mk 262 Mod 0 was adopted in 2002. Issues came up in development including reliability problems in different temperatures and when the weapon got dirty, and cycling issues in cold weather due to the slightly shorter barrel of the SPR compared to the full-length M16A2 barrel. The problems were addressed with a slower burning powder with a different pressure for use in the barrel, creating the Mk 262 Mod 1 in 2003. During the product improvement stage, the new propellant was found to be more sensitive to heat in weapon chambers during rapid firings, resulting in increased pressures and failure to extract. This was addressed with another powder blend with higher heat tolerance and improved brass. Also during the stage, Black Hills wanted the bullet to be given a cannelure, which had been previously rejected for fear it would affect accuracy. It was eventually added for effective crimping to ensure that the projectile would not move back into the case and cause a malfunction during auto-load feeding. Although the temperature sensitive powder and new bullet changed specifications, the designation remained as the Mod 1. According to US DoD sources, the Mk 262 round is capable of making kills at 700 meters. Ballistics tests found that the round caused "consistent initial yaw in soft tissue" between 3 and 4 in at ranges from 15 feet to 300 meters. Apparently it is superior to the standard M855 round when fired from an M4 or M16 rifle, increasing accuracy from 3–5 minutes of angle to 2 minute of angle. It possesses superior stopping power, and can allow for engagements to be extended to up to 700 meters when fired from an 18-inch barrel. It appears that this round can drastically improve the performance of any AR-15 weapon chambered to .223/5.56 mm. Superior accuracy, wounding capacity, stopping power and range have made this the preferred round of many special forces operators, and highly desirable as a replacement for the older, Belgian-designed 5.56×45mm SS109/M855 NATO round. In one engagement, a two-man special forces team reported 75 kills with 77 rounds. The Mk 262 has a higher ballistic coefficient than the M855 of (G1)0.362 / (G7)0.181, meaning it loses less velocity at long-range. Following early engagements in Afghanistan and Iraq, U.S. Special Operations Forces reported that M855 ammunition used in M4A1 rifles was ineffective. In 2005, the Pentagon issued a formal request to the ammunition industry for "enhanced" ammunition. The only business that responded was the Federal Cartridge Company, owned by Alliant Techsystems. Working with the Naval Surface Warfare Center Crane Division, the team created performance objectives for the new ammo: increased consistency from shot to shot regardless of temperature changes, accuracy out of an M4A1 better than 2 minute of angle (2 inches at 100 yards, 3.9 inches at 300 yards), increased stopping power after passing through "intermediate barriers" like walls and car windshields, increased performance and decreased muzzle flash out of shorter barrel FN SCAR rifles, and costs close to the M855. The first prototypes were delivered to the government in August 2007. Increased velocity and decreased muzzle flash were accomplished by the type of powder used. The design of the bullet was called the Open Tip Match Rear Penetrator (OTMRP). The front of it is an open tip backed up by a lead core, while the rear half is solid brass. When the bullet hits a hard barrier, the front half of the bullet crushes against the barrier, breaking it so the penetrating half of the bullet can go through and hit the target. With the lead section penetrating the target and the brass section following, it was referred to as a "barrier blind" bullet. Officially designated the Mk318 Mod 0 "Cartridge, Caliber 5.56mm Ball, Carbine, Barrier", and called SOST (Special Operations Science and Technology) ammunition, the 62-grain bullet fragments consistently, even out of a 10.5 in barrel. The lead portion fragments in the first few inches of soft tissue, then the solid copper rear penetrates 18 in of tissue (shown though ballistic gelatin) while tumbling. Out of a 14" in barrel, the Mk318 has a muzzle velocity of 2,925 ft/s (892 m/s). In February 2010, the U.S. Marine Corps adopted the Mk318 for use by infantry. To be fielded by an entire branch of the military, the round is classified as having an "open-tip" bullet, similar to the M118LR 7.62 NATO round. The SOST bullet uses a "reverse drawn" forming process. The base of the bullet is made first, the lead core is placed on top of it, and then the jacketing is pulled up around the lead core from bottom to tip. 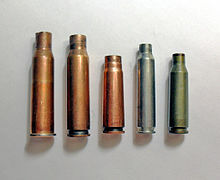 Conventional, and cheaper, bullets are made with the method of the jacket drawn from the nose to an exposed lead base. The reverse drawn technique leaves an open tip as a byproduct of the manufacturing process, and is not specifically designed for expansion or to affect terminal ballistics. The Pentagon legally cleared the rounds for Marine use in late January. The Marines fielded the Mk318 gradually and in small numbers. Initial studies showed that insurgents hit by it suffered larger exit wounds, although information was limited. SOST rounds were used alongside M855 rounds in situations where the SOST would be more effective. In July 2010, the Marines purchased 1.8 million M855A1 Enhanced Performance Rounds, in addition to millions of Mk318 rounds in service, as part of its effort to replace its M855 ammo. As of May 2015, Marine combat units still deployed with a mixture of both SOST and M855 rounds. As the issue of environmentally friendly ammo grew, the Marines looked to see if the Mk318's lead could be replaced while still meeting specifications. They found that by replacing the lead with copper and slightly stretching the jacket around to crimp the nose even more, the bullet's ballistic coefficient increased. To avoid visual confusion with the Mk 262 round, the bullet was entirely nickel-plated for a silver color; the enhanced silver-colored copper jacketed, open tip match, 62-grain projectile was named the Mk318 Mod 1. Swiss Army 50-round Gw Pat 90 ammunition box. Swiss Army Gw Lsp Pat 90 tracer rounds. The 5.6mm Gewehr Patrone 90 or GP 90 (5.6 mm Rifle Cartridge 90), is the standard round used by the Swiss military in its rifle, the SIG SG 550. The cartridge is also known as the Cart 5,6mm 90 F (French > Cartouche pour Fusil / Italian > Cartuccia per Fucile) to the French- and Italian-speaking Swiss militiamen. The Swiss refer to the round as the 5.6 mm Gw Pat 90, although it is interchangeable with the 5.56×45mm NATO and .223 Remington round. The Gw Pat 90 round firing a 4.1 g (63 gr) FMJ bullet is optimized for use in 5.56 mm (.223 in) caliber barrels with a 254 mm (1:10 in) twist rate. The Gw Pat 90 was designed for the SIG SG 550 when it came into production in 1987, replacing the SIG SG 510. Previous experience of a change in standard rifle had proved that changing the distance of fire for the training ranges was more expensive than the design of a new ammunition; this prompted the design of a cartridge nominally capable at 300 meters. The cartridge was also designed to reduce pollution by controlling lead emissions. The bullet was originally clad with a nickel alloy jacket, however, this was found to cause excessive barrel wear, so in 1998 the nickel jackets were replaced with tombac jackets. In addition, in 1999 a copper plug was added to the base of the bullet to address environmental concerns. The ammunition is currently (2009) produced by RUAG Ammotec, a subsidiary of the RUAG group. The ammunition is manufactured in three variations: the standard FMJ round, the tracer round, and a blank round. The FMJ cartridge has a Copper-Zinc alloy case and uses a double base propellant. The bullet is a 4.1 g (63 gr) tombac jacketed FMJ projectile with a G1 ballistic coefficient of 0.331 (ICAO) / 0.337 (Army Metro). The projectile contains approximately 95% Pb, 2% Sb, 3% Cu, and was designed for terminal ballistic instability. The required accuracy for Gw Pat 90 ammunition out of factory test barrels is 63 mm (0.72 MOA) for 10 rounds (100% radius measurement method) out to 300 m. The Gw Pat 90 cartridge dimensions are in accordance with the civilian C.I.P. standards for the .223 Remington C.I.P. chambering. The Gw Pat 90 is used both in the Swiss military and in sport shooting. The very high level of individual training in the Swiss militia (every single soldier bearing a weapon has to shoot for qualification once a year; see Gun laws in Switzerland) and the overall use of the Gw Pat 90 by the many Swiss citizens who shoot in competitions and for amusement has resulted in significant input on its usage. Over 1 billion cartridges had been produced as of 2005[update]. ^ "C.I.P. decisions, texts and tables – free current C.I.P. CD-ROM version download (ZIP and RAR format)". Archived from the original on June 6, 2009. Retrieved 2008-10-17. ^ Woods, Jeffrey K. (May 4, 2011). "M855A1 Enhanced Performance Round (EPR) Media Day" (PDF). Retrieved Dec 29, 2017. ^ a b c d e f g h i j k l m n o p q Watters, Daniel. "A 5.56 X 45mm "Timeline"". wayback.org. Archived from the original on 9 February 2004. Retrieved 6 March 2017. ^ Barnes, Frank C. (1972). Cartridges of the World. Northfield Il: DBI Books. p. 37. ISBN 978-0-695-80326-1. ^ "U.S. Rifle, cal. 7.62mm, M14". chuckhawks.com. Retrieved 6 March 2017. ^ a b c Barnes, Frank C. (2016). Cartridges of the World. Iola, WI, USA: Krause Publishing. p. 88. ISBN 978-1-4402-4265-6. ^ a b c ".223 Remington Vs. 5.56: What's in a Name?". americanrifleman.org. Retrieved 6 March 2017. ^ "An Improved Battlesight Zero for the M4 Carbine and M16A2 Rifle". Retrieved 2007-09-11. ^ "TM 9-1005-319-10 (2010) - Operator's Manual for Rifle, 5.56 MM, M16A2/M16A3/M4 (Battlesight Zero pages 48-55)" (PDF). Retrieved 2014-06-03. ^ "5.45×39: Small But Perfect, A History of Development (Part 1)". thefirearmblog.com. 2016-01-10. Retrieved 6 March 2017. ^ "SAAMI Pressures". Archived from the original on 14 October 2007. Retrieved 2007-11-29. ^ "C.I.P. TDCC .223 Rem" (PDF). Archived from the original (PDF) on 2018-06-21. Retrieved 2018-06-21. ^ "Armalite / Colt AR-15 / M16 M16A1 M16A2 M16A3 M16A4 assault rifle (USA)". modernfirearms.net. 2010-10-27. Retrieved 7 March 2017. ^ a b Wood, Keith (2016-11-17). "How to Pair Barrel Twist Rates with Bullets". gunsandammo.com. Retrieved 7 March 2017. ^ "How to Pair Barrel Twist Rates with Bullets". gunsandammo.com. 2016-11-17. Retrieved 6 March 2017. ^ "Reading Gunshot Patterns". NIH.gov. National Institute of Health. Retrieved 14 October 2010. ^ "Patterns of Military Rifle Bullets". ^ Chamberlin, F. T., "Gun Shot Wounds", in Handbook for Shooters and Reloaders, Vol. II, Ackley PO, ed., Plaza Publishing, Salt Lake City, Utah, 1966. ^ Sturtevant B, Shock Wave Effects in Biomechanics, Sadhana, 23: 579–596, 1998. ^ Fackler, Martin. "The Shockwave Myth" (PDF). Archived from the original (PDF) on May 28, 2008. ^ Pd Igman D.D. Konjic Bosnia And Herzegovina : Ammunition Archived 2008-03-25 at the Wayback Machine. Igman.co.ba. Retrieved on 2011-01-08. ^ a b c d "Is there a problem with the lethality of the 5.56 NATO caliber?" (PDF). Archived from the original (PDF) on 2013-10-04. Retrieved 2013-08-31. ^ Avery, Joseph P. (July–August 2012). "An Army Outgunned: Physics Demands A New Basic Combat Weapon" (PDF). Military Review. Archived from the original (PDF) on December 29, 2017. Retrieved Dec 29, 2017. ^ "EFFECTS OF BARREL LENGTH ON BORE PRESSURE, PROJECTILE VELOCITY and SOUND MEASUREMENT by Philip H. Dater, MD GEMTECH Boise, ID and Jason M. Wong Firearms Law Group Seattle, WA 2010 at US DEFENSE TECHNICAL INFORMATION CENTER (DTIC)" (PDF). Archived from the original (PDF) on 2016-03-04. Retrieved 2014-11-16. ^ Liu, YQ; Wu, BJ; Xie, GP; Chen, ZC; Tang, CG; Wang, ZG (1982). "Wounding effects of two types of bullets on soft tissue of dogs". Acta Chir Scand Suppl. 508: 211–21. PMID 6952680. ^ "Army Weapons Qualification Course". military.com. Wiley Publishing. Retrieved 16 January 2015. ^ Jane's International Defense Review: IDR., Volume 39, Issues 1–6. p. 86. (2006). ^ a b "DUAL PATH STRATEGY SERIES: PART III – SOLDIER BATTLEFIELD EFFECTIVENESS" (PDF). Archived from the original (PDF) on 2014-05-28. Retrieved 2013-10-26. ^ John Pike. "6.8x43mm SPC (Special Purpose Cartridge)". Globalsecurity.org. ^ Dan Lamothe. "Corps to pass on Army upgrades to M4". Army Times Publishing Company. Archived from the original on 25 September 2010. Retrieved 13 September 2010. ^ Stokes, Jon (20 January 2014). "LWRC: 6.8 SPC is the New 300 Blackout". ^ 6mmbr.com. "223 Rem + 223 AI Cartridge Guide". ^ "5.56 vs .223 – What You Know May Be Wrong". 2012-06-22. Retrieved 13 June 2013. ^ "Cartridge Pressure Standards". Retrieved 14 June 2013. ^ ".223 Remington Vs. 5.56: What's in a Name?". www.americanrifleman.org. ^ Patrick Sweeney, "Chamber Reality Check", Peterson's Rifle Shooter, Volume 16, Issue 2, March/April 2013, pp. 32–36. ^ SAAMI on 5.56 v. .223 Remington Archived 2006-06-13 at the Wayback Machine. The Gun Zone. Retrieved on 2011-01-08. ^ Ezell, Edward Clinton (1983). Small Arms of the World. New York: Stackpole Books. pp. 46–47. ISBN 978-0-88029-601-4. ^ "Ak 47 Technical Description - Manual". Scribd.com. 2010-09-30. Retrieved 2012-08-23. ^ a b Dockery, Kevin (2007). Future Weapons. p. 102. ^ a b c d e Dockery, Kevin (2007). Future Weapons. New York, NY, USA: Berkley Publishing Group. ISBN 978-0-425-21215-8. ^ "Официальный сайт группы предприятий "ИЖМАШ"". Izhmash.ru. 2001-09-02. Archived from the original on 2014-10-06. Retrieved 2012-08-23. ^ a b 5.56mm (5.56 × 45 mm) Ammunition. Inetres.com (2005-05-03). Retrieved on 2011-01-08. ^ KE = 1/2mv2, where m is in kilograms and v is in metres per second. ^ a b 7.62mm (7.62 × 51 mm) Ammunition. Inetres.com. Retrieved on 2011-01-08. ^ "Improving In-Service Small Arms Systems – An Australian Experience" (PDF). Archived from the original (PDF) on 2016-10-20. Retrieved 2012-01-13. ^ a b c "Small Caliber Ammunition Enhancing Capabilities, 20 May 2010" (PDF). Archived from the original (PDF) on 30 November 2012. Retrieved 8 November 2012. ^ "5.56MM REDUCED RICOCHET LIMITED PENETRATION (RRLP), MK 255 Mod 0" (PDF). Archived from the original (PDF) on 2013-07-19. Retrieved 2013-11-06. ^ "Corps to use more lethal ammo in Afghanistan at www.marinecorpstimes.com". Archived from the original on 2010-04-22. ^ a b c d e Dean, Gleen (3 March 2012). "In Search of Lethality: Green Ammo and the M855A1 Enhanced Performance Round". ^ Military.com. "Military Daily News - Military.com". ^ "U.S. Army Issues New M855A1 Ammo to Troops in Afghanistan « Daily Bulletin". ^ "M855A1 Enhanced Performance Round (EPR), LTC Philip Clark, Product Manager Small Caliber Ammunition, April 2012" (PDF). ^ a b "The 6.5×40 Cartridge: Longer Reach for the M4 & M16". ^ Lamothe, Dan; Cox, Matthew (12 July 2010). "Corps takes a new look at green bullet". Marine Corps Times. Archived from the original on 16 July 2010. Retrieved 12 July 2010. ^ Lopez, Todd. "'Green bullet' as effective as M855 round – consistently." US Army News Service, 8 May 2011. ^ "Evolution of an AR - A look where the M16/AR-15 platform is headed". Guns & Ammo. Archived from the original on 2011-09-15. ^ AA53, Cartridge, Caliber 5.56mm Special Ball, Long Range Mk 262 Mod 0. Globalsecurity.org. Retrieved on 2011-01-08. ^ a b "Swiss Ammunition Enterprise - Cybershooters". Stan Christ, "5.56mm NATO Alternatives", Special Weapons Magazine, Semi-Annual #50 2007, pp. 52–59. 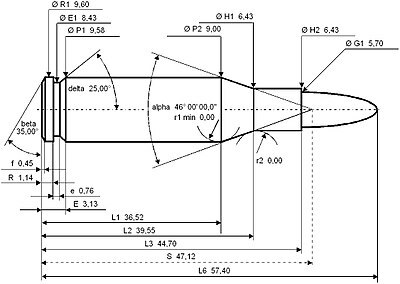 "brochure on 5.56mm F1 ball ammunition to NATO STANAG 4172" (PDF). ADI Thales. Archived from the original (PDF) on 2008-07-21.